Imagine laying on a Sound Table, putting on 3D Virtual Reality glasses, looking down and seeing a Virtual Reality Image of inside of you body. You could choose to see a graphic of each organ, bone, muscle, or your chakras or auras. You or your practitioner could then place a healing visual inside a particular part of your body. A corresponding healing sound would then automatically moved up and down on the sound table (massage table with speakers mounted on the bottom), so you feel the sound inside your body precisely where you are seeing the visual in 3D. At the Institute we are developing complete databases of sounds (frequencies, timbres and music) and visuals for each part of the body, and for specific issue. You could have a whole mix spread throughout your body. Imagine having a symphony placed throughout your body both visually and aurally. However, in one respect, this is still the allopathic model, which focuses on what is wrong. We will also be using sounds and visuals to light up all of your chakras and auras — your entire light body — with the goal accessing higher states of consciousness, your higher self, your Soul, and a direct connection to Source where you are one with everything in the Universe. We are partnering with various companies that have developed assessment systems such as Nutri-Energetics and voice analysis systems. Based on the assessment specific sounds, colors and shapes will automatically be moved inside of organs and various parts of the body. 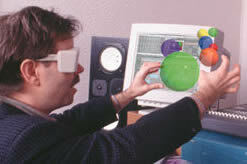 What we are talking about is Aided Visualization as a training system for you to be able to do your own visualization. Once you have sounds corresponding to visuals inside your body it opens up a whole range of possibilities. This type of aided visualization has limitless possibilities that we are only beginning to explore. The next step is to partner with doctors and facilities in the medical field to create very specific medical devices for a full range of organs, tissues cells and diseases. We have initiated a project to map all of the frequencies of every part of the body. The project is called the GeneOM project. The goal is to map all of the frequencies and rhythms in the body, but since many of these will be different from person to person, we will be looking for the musical intervals or relationships between the various parts of the body. The assumption is that the musical intervals between different parts of the body will be the same from person to person. That is, in a healthy person. We assume that if someone is sick that the musical intervals will be off — kind of like one person in the symphony being sick or out of tune. We should then be able to find the template of healthy musical intervals for a typical healthy human. We can then use that symphony of sounds to resonate people back into healthy functioning. Ultimately, we will be able to find the template of perfection that a particular individual is born with, and resonate a more specific symphony of harmony. Ultimately, you will be able to step into an image of your own body and have biological responses in your body tell the computer what frequencies, colors and shapes are needed. Check out the GeneOM website (under construction) by CLICKING HERE. The Institute is currently developing a system that uses 3D visuals of sounds to control a mixing board. The unit is called the Virtual Mixer. Put on 3D glasses and you will be able to see visuals of each sound in a mix floating between the speakers right where the actual sounds are left and right in the stereo field. You can then “grab” the visuals of sounds with a dataglove and move them around. This sends information to the mixer (or software), which actually moves the sounds around between the speakers. You can control all the functions in a recording studio including volume, panning (left/right placement), equalization and effects. In full Virtual Reality and Surround Sound you can actually see sounds floating around the room. With a Dataglove you can grab the sounds and throw them around the room. For more information on the Virtual Mixer and to see many visuals of mixes (including Videos of Mixes in real time) CLICK HERE. 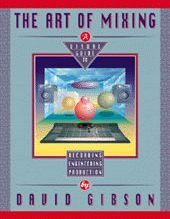 You can also check out the book, “The Art of Mixing” that uses visuals of mixes to explain how to mix. The future will not be boring. It will also not include as much sickness. And, the healing modes will not have side effects. Ultimately, we will be given back the power to heal ourselves. 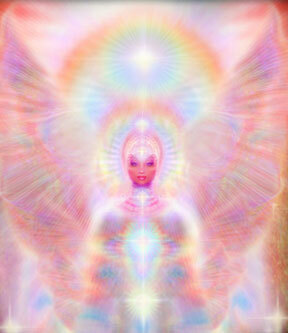 Love and Light whenever needed.